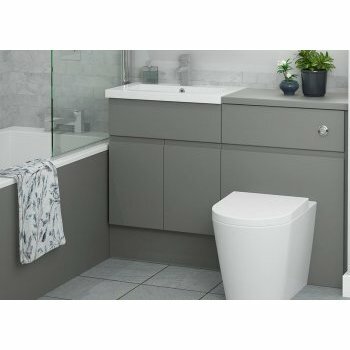 On display in our showroom, we have the ultra sleek and modern 'Dust Grey Grip' style in a cloakroom setting to show just how much storage you can fit in such a snug space. It is complimented with a Vitra semi recessed basin and back to wall wc. The grip door range is also available in the Truffle Oak, White gloss and Natural Oak finishes. ALL OF THE ATLANTA DOOR SAMPLES CAN BE FOUND ON DISPLAY IN OUR SHOWROOM.